Screen shot of opening image in Andrew Sweeny’s infographic. Below is an “Infographic” depicting the great structural innovations of architectural history, kindly sent to me by Andrew Sweeny, of Pennywell, a company in Ireland that produces upscale kitchen work surfaces. Sweeny entitles his Infographic “The Greatest Buildings of World History.” Insofar as it includes the egregious Millennium Dome, in London, which is more like a tent than a building, the title is mistaken. In fact, the latest Pritzker Prize winner, Frei Otto, of Germany, was renowned exclusively for his tent-like structures. His Pritzker is merely another reason why Sweeny should not have included the Dome in his Infographic. And indeed Sweeny did strike the Dome off the Infographic after I objected to its inclusion, but I insisted on keeping it in, if only to abet the controversy that keeps blogs like this afloat. The final building in the infographic, the Burj Khalifa, in Dubai, is the tallest building in the world, and that must count as innovative. Still, completed in 2010, it has not stood the test of time. But I quibble. The Infographic is filled with great details and is graphically intriguing. But let me insert one more quibble. Why is the White House on the list? It houses great men but is hardly a great building – nice enough, not great. Maybe housing U.S. presidents is some sort of engineering feat. I don’t think so! What is amazing about the White House is the extent to which an apparently unprecedented number of non-presidents have been able to climb its wrought-iron fence along Pennsylvania Avenue and approach (or even enter) the Executive Mansion. The only major error I found in the infographic was in this segment. Try to find it. In fact, naming the great buildings left off this Infographic of the Greatest Buildings of World History makes a great parlor game. You first! In addition to viewing the infographic, the reader is also entitled and indeed urged to click on a link to the website of Pennywell. Renovating your kitchen? Go for it! Hats off to Andrew Sweeny and Pennywell for producing The Greatest Buildings of World History. This entry was posted in Architecture, Architecture History, Books and Culture, Development, Humor, Other countries, Preservation and tagged Andrew Sweeny, Burj Khalifa, Innovation, Ireland, Millennium Dome, Pennywell, Preservation, White House, World's Greatest Buildings. Bookmark the permalink. Yes, really important to read your intro, because this list left me scratching my balding scalp. One, I couldn’t believe you would agree with many, if not most of these choices. And two, I certainly don’t. 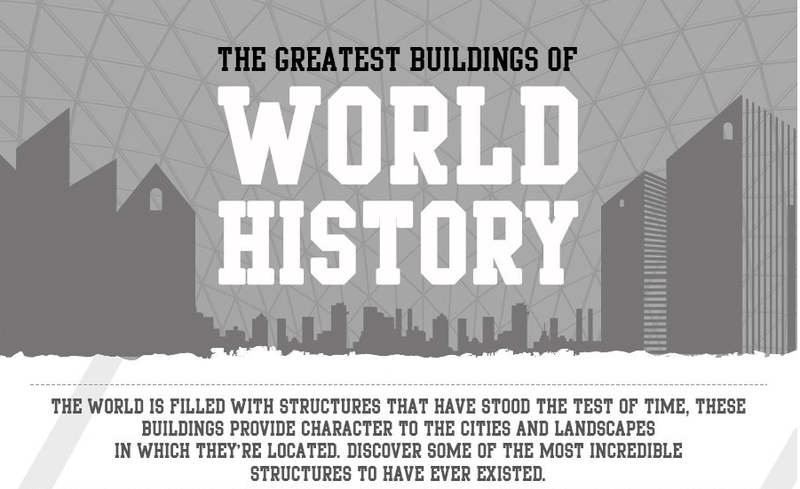 World’s greatest buildings? Monuments, perhaps, and not even then. Somehow the White House was relocated to the middle of Washington State!